Radio-PTT Vision was the first television station in France. It began broadcasting on 26 April 1935. Through a transmitter located atop the Eiffel Tower the station broadcast programmes three days a week from 11 am to 11:30 am and 8 pm to 8:30 pm and on Sundays from 5:30 pm to 7:30 pm. This channel was the only one in France for 28 years, and it is one of the oldest television stations in the world. Incidentally, the world's first television station started in 1928. It was called WRGB and it broadcast from the General Electric facility in Schenectady, NY. 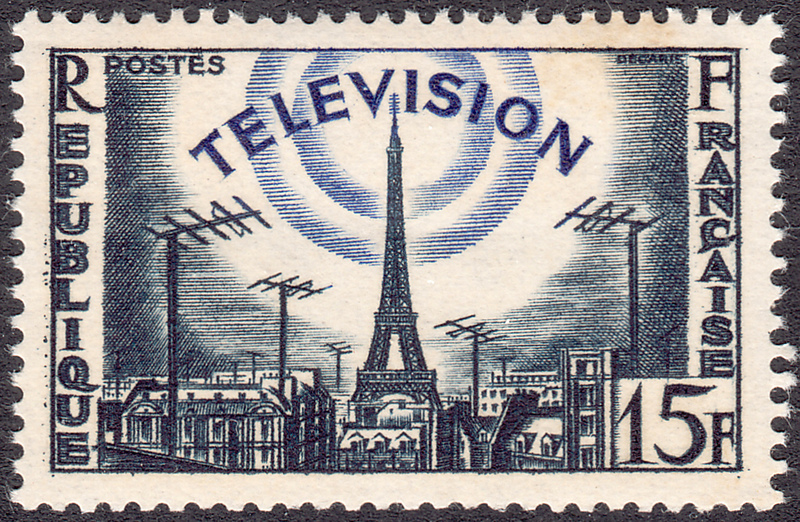 On 18 April 1955 France issued a stamp commemorating television in France. The stamp was designed and engraved by Albert Decaris. 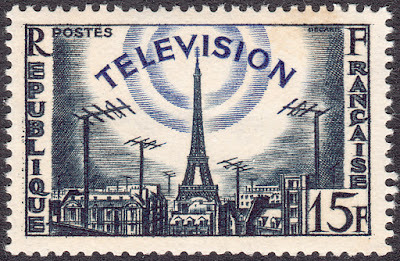 In this design Decaris has illustrated a television signal emanating from the Eiffel Tower, which has been placed right in the centre of the image. Elongated antennae represent all the television antennas in the city of Paris, picking up the signal. The radiating signal to me suggests of a rising sun spreading its light on a new dawn - a new dawn of technology.